NEW YORK–– Mayor de Blasio, New York City Economic Development Corporation (NYCEDC) President Maria Torres-Springer and Council Speaker Melissa Mark-Viverito recently announced the grand opening of the Damian Family Care Center’s Third Avenue Family Health Center, a new community health center providing more than 10,000 people in the South Bronx with access to healthcare regardless of a patient’s ability to pay. 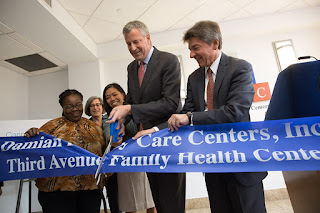 The Third Avenue Family Health Center opens as part of the Caring Neighborhoodsinitiative, a vital part of the administration’s commitment to reduce health disparities through building primary care capacity in neighborhoods where New Yorkers have faced limited options for convenient and affordable health care services. In total, over 100,000 new patients will be able to receive care in their own neighborhoods thanks to the community health centers expanded through Caring Neighborhoods.